The Canadian side of Coyote Bank sits just 11 nautical miles from Ediz Hook, but often times uncomfortably in the middle of the Strait of Juan de Fuca. 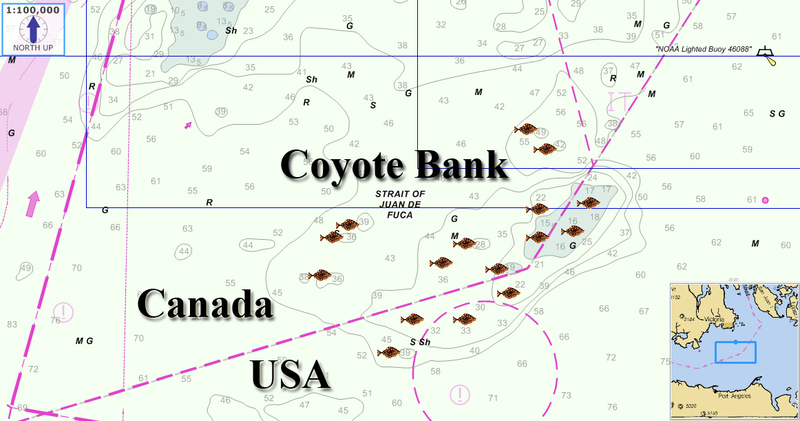 As you can see, Coyote Bank offers numerous places for halibut to hide. Choosing where to fish, on the U.S. or Canadian side of the border will depend on several factors. First off, to take advantage of the entire bank, purchase a Canadian saltwater license, information below. Once you have your license watch the tides and currents. During an incoming tide, fish the east side of the bank, or anywhere on the bank that offers a uphill slope to the west. Outgoing tides will put you on the west side of the bank. Halibut put their eyes into current, waiting for unsuspecting baitfish. Knowing this should help you decide the best place to find halibut. Also, some areas only produce during either a high or low tide, so keep track in your fishing logbook. Depth also remains an important factor where to fish for halibut on Coyote Bank. During strong tides go shallow. These tides push and concentrate bait into the shallow humps, bumps and shallow areas of the bank. 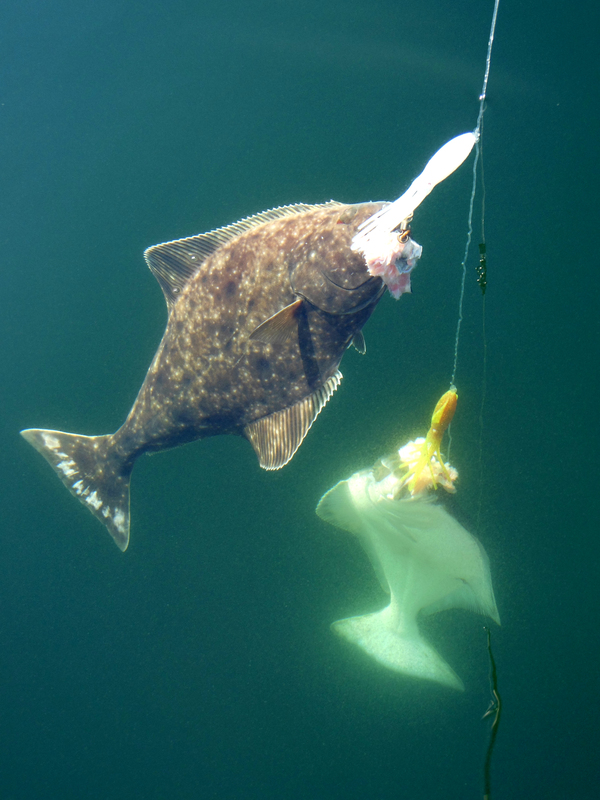 Weak tides scatter the bait and force halibut to search for different feed in deeper areas. Best baits include herring, squid, salmon bellies, sardines, mackerel, octopus or shad bellies if you have them. I always put a piece of bait on my lure’s hook and fish lures and baits about four feet off bottom. Best lure colors include ultraviolet, glow, rootbeer, orange/glow and pink/glow. 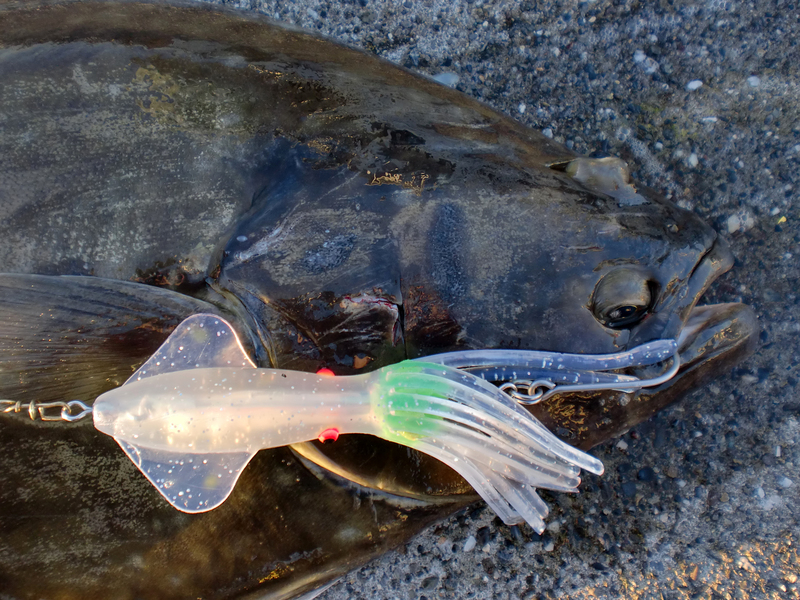 10-inch FAT Squids come with 9/0 stainless J hooks, but can be switched out for a circle hook. Anglers that like to hold the rod and jerk to set the hook should use a J hook. For those who like to put the rod in the rod holder and wait will do best with a circle hook. The circle hook should never be jerked. Patience is required when using the circle hook. When you see a bite when using a circle hook let the fish take the bait or lure, wait for the rod to load and bend and line to come off the reel then slowly begin reeling. This should allow the circle hook to do its job. Here’s a map an current information about fishing the Canadian side of Coyote Bank. This entry was posted in B.C. Halibut Maps, Washington Halibut Maps and tagged Coyote Bank, Coyote Bank Halibut Fishing, Fishing Halibut in B.C., Fishing Halibut in Canada, Halibut Fishing, Halibut Fishing Coyote Bank. Bookmark the permalink.